Fridley High School senior Nadia Hawkins was thrilled to receive her acceptance notification to Carleton College, one of the most prestigious liberal arts colleges in the nation. However, the letter that followed a few days later far exceeded her expectations - Nadia received more than $70,000 in grant and scholarship funds from the college. When Nadia was applying to colleges in the fall, she added Carleton to her Common Application, an online admissions portal that allows students to apply to multiple colleges and universities. Before she finished, she was contacted by a Carleton College admissions officer, who highly encouraged her to consider the school. Carleton, located in Northfield, Minn., is a small, private liberal arts college known for rigorous academics, selective admissions, and notable alumni. “The Carleton admissions officer told me that I reminded her of herself based on my application and college essay,” said Nadia. In Nadia’s essay, she wrote about how emotions cannot be used as a reliable source of evidence in arguments. “Emotions strengthen arguments beyond our ability to oppose them. You can’t necessarily measure one person’s emotions in comparison to another’s. I argued that if you are going to use them as a reliable source of evidence, then they have to be backed up by facts,” she said. “She read my essay and said it reminded her of what she learned at Carleton, and if this is something I’m interested in, then I should look into the school,” Nadia said. The topic of Nadia’s creative college essay prompt stemmed from a final project she completed in Theory of Knowledge (ToK), an International Baccalaureate (IB) class, during her junior year at Fridley High School. The final essay required students to compare and contrast the different areas of knowledge. Throughout the years, projects completed in ToK have allowed multiple Fridley High School students to earn valuable opportunities, like presenting their projects as TED-Ed Talks at worldwide conferences in New York City and Vancouver. After the admissions officer arranged her campus visit, complete with transportation and class sit-ins, Nadia immediately settled on her decision to attend Carleton. Nadia said she has always wanted to attend a prestigious college like Carleton. 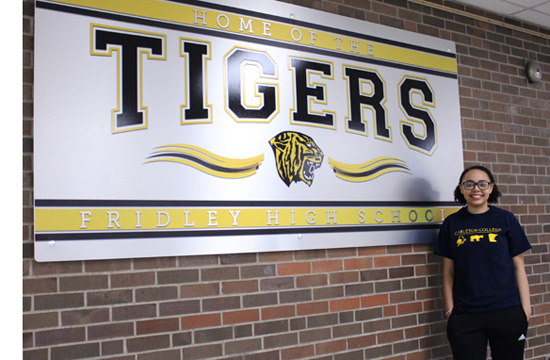 In preparation for college-level academics, she enrolled in Fridley High School’s IB Diploma Programme (DP) and is currently working to earn her IB Diploma. The IB DP is offered to juniors and seniors at Fridley High School and requires an extensive amount of coursework, lengthy essays, difficult exams and hours of community service, along with internal and external assessments. Students who take advantage of this opportunity often stand out to college admissions officers, as the program is known worldwide as a challenging, intellectual experience, and readily prepares high school students for the academic rigor of college classes. Nadia added that the fundamentals of the IB curriculum framework have helped to develop her as a person. In addition, Nadia is highly-involved in multiple clubs and activities. She is treasurer of the Student Council and has participated in theater, Improv club, speech team, Youth In Government, Gay-Straight Alliance, and Tigers United, a culturally and linguistically responsive team of students who provide feedback to teachers and staff in regard to positive school culture. When considering majors, Nadia has a breadth of interests that she wants to explore, including English and history, but she’s currently leaning toward biology. Nadia added that she is thankful for her support system, which includes her mother and two sisters, as well as the helpful teachers, staff and classmates at Fridley High School. Congratulations, Nadia, and we wish you best of luck at Carleton College!